This is information published by Gena Hamshaw on her blog Choosing Raw on July 13th 2010 was sent to me by Angela who has a great blog called Uberdish. Well worth following. When choosing any sweetener, it’s wise to use in moderation. And not freak out and swear them all off because of one thing you read online. Agave nectar, which has been gaining popularity as an alternative sweetener, is a syrup composed primarily of fructose and harvested from the blue agave plant (which is also the plant that gives us tequila). Fructose has been shown to make our blood sugar spike far less dramatically than sucrose (table sugar), which is why agave is often considered a suitable choice for diabetics. It’s also a good option for strict vegans, who don’t consume honey, and for people with food allergies, since it’s allergen free. This year, two articles threatened to knock agave off of its throne. First, Natural News published an article by a Canadian journalist that likened agave to high fructose corn syrup (the highly processed sweetener that has been definitively linked to obesity). Next, Joseph Mercola, a writer who’s known for stirring up controversy on his website, piggybacked off of the Natural News article and publicly declaimed on his site. Within weeks, the agave backlash was in full force. Anyone in the health biz learns that manias and refutations are commonplace. What’s important is that we as consumers know how to separate alarmism from truth. So let’s look at the accusations against agave. Sure, it’s valid to note that agave is made through hydrolyzing and heating, and that it’s thus a “processed” food. But does that mean that it’s automatically a health hazard? Not necessarily. Note that Rami Nagel’s original article is based mostly on the author’s own understanding of agave production, as well as conversations with manufacturers. He offers little Q & A with medical professionals, and his article isn’t founded upon robust evidence from clinical trials. Mercola, meanwhile, declares that all fructose, regardless of its origin, will hinder weight loss; this isn’t a statement with which most mainstream doctors or RDs typically agree. Lab studies do suggest, however hazily, that fructose is safer for diabetics than sucrose. And while high fructose corn syrup (HFCS) has been proven dangerous in excess, we have yet to get a series of clinical studies suggesting that all forms of fructose (agave included) are similarly harmful. In other words, drawing a comparison between the production of agave and HFCS doesn’t necessarily mean that the products carry the same risks. Likewise, making blanket statements about the comparative risks of glucose, fructose, and sucrose is a risky business, especially when those statements don’t come from chemists or doctors. Beyond this, how “healthy” a food is isn’t only a matter of its chemical composition or production; it’s also a matter of how the food is consumed. If you’re dumping agave over every dish, you’d do best to take it easy. In general, it’s wise to use concentrated sweeteners (like agave, honey, or maple syrup) selectively. I advise my clients use Stevia when they’re looking for a sweetener to add to beverages (like coffee), or if they want to sweeten a serving of food. 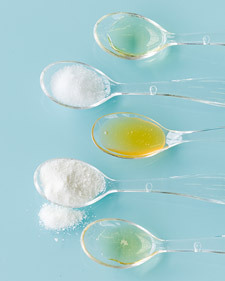 In baked goods, salad dressings, or soups—in other words, when the sweetener will be evenly distributed throughout a dish, rather than consumed directly and in high concentration—it’s fine to use a bit of agave. It’s still a humane alternative for vegans, and while the jury’s out on whether or not it’s a “health food,” we don’t yet have enough clinical evidence to condemn it as harmful, either. When inflammatory claims emerge (either positive or negative), it’s important to remember that the nutrition field is highly susceptible to alarmism. Wait until you’ve read more than one or even a few sources before you jump to conclusions, and try not to take information out of context. What may prove harmful in a clinical trial may yet be tolerable when consumed in moderation. Collect information, use common sense, and avoid the panic button.